TV show dates: December 23, 2016 — December 14, 2018. Performers include: Eric McCormack, MacKenzie Porter, Nesta Cooper, Jared Abrahamson, Reilly Dolman, Patrick Gilmore, J. Alex Brinson, Leah Cairns, Enrico Colantoni, Chad Krowchuk, Arnold Pinnock, Jennifer Spence, and Ian Tracey. 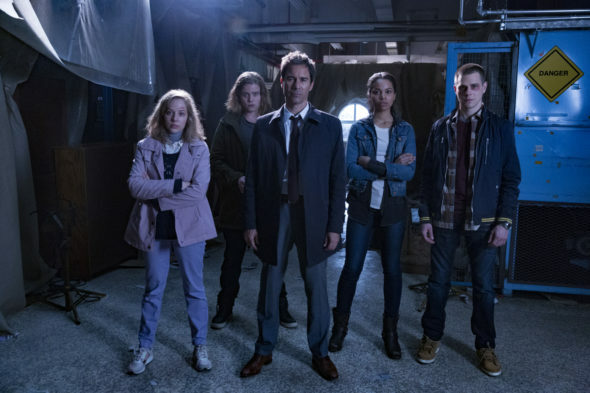 A Canadian-American science-fiction mystery drama from creator Brad Wright, the Travelers TV show unfolds in a post-apocalyptic future, in which special operatives travel back in time to save humanity from destruction. Unlike many time-travel stories, there is no time machine involved. Instead, a special operative known as a “traveler” transfers his or her consciousness into the body of “target” just prior to that person’s death. Locating the 21st-century target in the right time and place is possible, thanks to people’s reliance on smartphones, social media, GPS, and the like. Once a traveler has pinpointed and taken over a target’s body, that traveler must live in-character as the host (i.e. the person who originally possessed the body). While going about the business of living the target’s life, the traveler — as part of a team of five — carries out secret missions in furtherance of the cause. They report to an entity known as “the Director” — an artificial intelligence dedicated to saving the world. The Director monitors events of the 21st century, as the travelers carry out their missions. The story centers on a team of five operatives. Traveler 3468, aka Grant MacLaren (McCormack), is the team leader who takes over the life an FBI Special Agent. Working along with him are: Traveler 3569, aka Marcy Warton (Porter), who is living as an intellectually disabled person; Traveler 3465, aka Carly Shannon (Cooper), the team tactician, who is living as single mom; Traveler 0115, aka Trevor Holden (Abrahamson), the team engineer who is posing as a high school athlete, despite being one of the oldest humans in existence; and Traveler 3326, aka Philip Pearson (Dolman), the team historian who has taken over the life of a young opioid addict. Together, they must work to save the human race, while appearing to all around them as ordinary people of the targets’ time and place. What do you think? Do you like the Travelers TV series? Should this Netflix TV show have been cancelled or renewed for season four? This show was entire to adored … by way to many people for Netflix to cancel. Especially, without an excuse. I just found this series and I am disappointed to find out it is cancelled. Strange that you would cancel such a great series! I guess the sci fi community has learned nothing from theFire fly series ! Would love to see if renewed! Loved this show. I can see using same characters as well as new ones. Sad to hear it was cancelled. I hope someone picks it up. Wow, what a show! I’m always astounded by the dreck that continues season after season while a sophisticated, well-produced show like Travelers gets the boot. My condolences to producer and star Eric McCormack and the rest of the wildly talented cast and crew. You deserved better. I totally agree with what you said. I’ve thoroughly enjoyed every episode of this series. What the what?!? This was the show that taught me what “binge” watching really was about!!! What an incredibly talented and cohesive cast! And the writing, the pacing… all of it, I was so sure that Netflix had become THE premier vehicle for new, edgy, and utterly engaging TV. So you have Omega’d all of us to forever be banished into a future bereft of seeing what happens next?!?! Damn you, Netflix!